Finest Cincinnati Restaurants in Northside! Cincinnati Magazine Pick: Six of the finest restaurants in Cincinnati are located in Northside! Northside now has the most ethnic restaurants in the city of Cincinnati, including Nepalese, Middle Eastern, African, Indian, Mexican, and Eclectic Tex-Mex! Check out all the NEW places listed below! 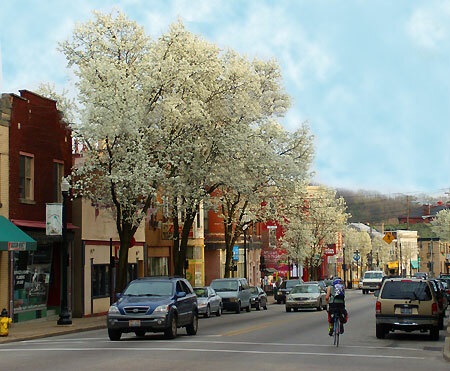 Hamilton Avenue, Northside's beautiful main street. Cincinnati Magazine Best Restaurant Picks lists "Best Restaurant Blocks: "the restaurants hovering around Hamilton Avenue in Northside." New Wine and Craft Beer Bar LISTING LOON. Address: 4124 Hamilton Ave, Cincinnati, OH 45223 Phone: (513) 542-5666 A cozy little place with very friendly people. Take a wine tour! A NEW NEPALESE RESTAURANT IN NORTHSIDE! BRIDGES. Address: 4165 Hamilton Ave, Cincinnati, OH 45223 Phone: (513) 374-9354 Probably the only Nepalese restaurant in the entire city. Totally unique cuisine, like nothing you've ever tasted! NEW LOCATION, SMALLER, AND BETTER THAN EVER! DJANGO'S TACOS has moved up the street to 4172 Hamilton Ave. Incredibly flavorful tacos, great quesadillas, amazing tex-mex with a unique twists! Public parking immediately behind the restaurant or on the street in front. Closes at 10:00 pm. Indian restaurant - DUSMESH, 944 Ludlow Avenue, 221-8900, at the bottom of Clifton Avenue near the police station, across from Cincinnati State. Inexpensiove luncheon buffet. We've noticed that the parking lot is always jammed--a good sign! MELT HAS MOVED DOWN THE STREET! Used to be next to Northside Tavern. Now in its new location at the corner of Hamilton and Blue Rock. Vegetarian sandwiches. Some meat for you carnivores. Really great sandwiches! We are listing this one first because we dine here so often and are always surprised by the variety of the menu, the quality of the menu, and how much it changes. The world's only curry ice-cream can sometimes be had here. See www.meltcincy.com for details. Northside has several new ample parking areas! NORTHSIDE TAVERN, 4163 Hamilton Avenue in Northside, received Best of Cincinnati 2005 from Cincinnati Magazine. Not really a restaurant, but you can pick up food next door and bring it in to eat with your beer. Great beer on tap. Bands start late on weekends. GREAT AMBIENCE! This is the only tavern in Cincinnati that reminds us of pubs in Europe. Doesn't have the slick, corporate look. You won't feel like a tourist, and sometimes the music will knock your socks off. One night we found that Slavic Soul Party had come from the heart of New York City to amaze and captivate everyone there. Totally changed our mind about what kind of music you can play in a bar! In addition to occasional world-class entertainment, Northside Tavern has truly great beer on tap. 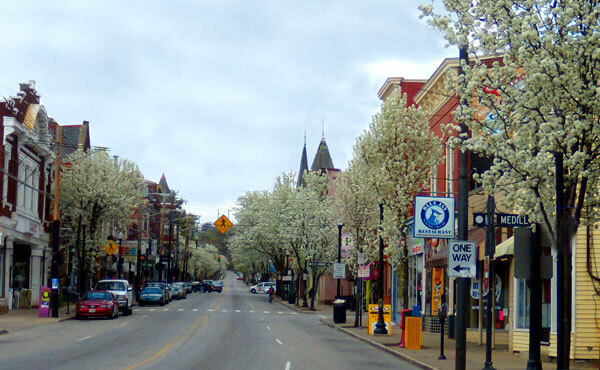 They also host classical string quartets playing Mozart, early music with the Noyse Merchants, and other favorites.THE place to hang out in Northside. NorthsideTavern.com. 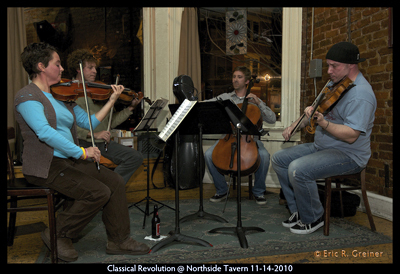 Classical Revolution playing string quartets at Northside Tavern on the first Monday of each month. We have also seen wind trios, brass ensembles, and on one occasion, a mini production of La Boheme with classically trained opera singers! Have a Guiness with your Mozart! 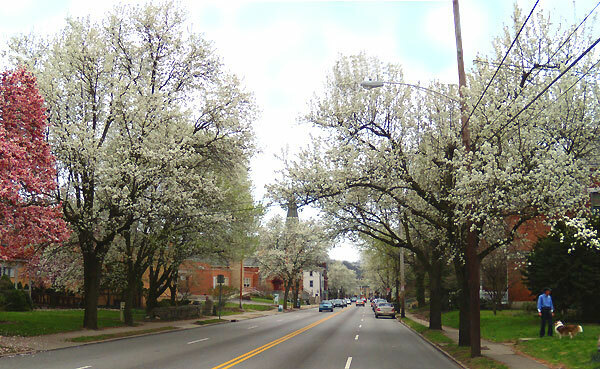 Spring just never ends in Northside! BISTRO GRACE, 4034 Hamilton Avenue. Culinery creations and craft beer. BLUE JAY, 4154 Hamilton Avenue, 513-541-0847 (shown below). More good old American food at good old American prices. Our favorite to just sit and chat over eggs and toast. THE KITCHEN FACTORY, 1609 Chase Avenue, 513-591-3333. Veg-friendly dinner and late night pizza window. BONOMINI BAKERY, 1677 Blue Rock St, Cincinnati, OH 45223 Phone:(513) 541-7501 This little family-owned bakery is our choice for the best in Cincinnati. Stop in and compare their offerings to the more well-known bakeries. You will be pleasantly surprised. One of Northside's best kept secrets! PARK CHILI PARLOR, 4160 Hamilton family owned and operated since 1937 has finally closed its doors. Watch this storefront for a new restaurant! Another beautiful day in Northside! Northsidians first choice for wine, champagne, spirits, liqueur, beer, porter, stout, ale, malt liquor, julep, stingo, bitters, lager, posset, wassail, apéritif, high-ball, cocktail, whisky, rum, absinthe, and gin. The cup that cheers but not inebriates! CHAMELEON, 4114 Hamilton Avenue. (513) 541-2073 Used to be The Fifth Amendment. New Owner. New Decor. Great place to stop in after work or any evening! C & D CAFE, 1714 Hanaford. This is the oldest bar in the neighborhood, where locals gather. This place has a really warm feel to it. Everyone there is so friendly! It has become a favorite of many Northsideans. They have great DJ's in the back room and a firepit outside in the colder months. THE LISTING LOON, 4124 Hamilton Avenue. 513-542-LOON. Craft beer, wine, nightly performances. 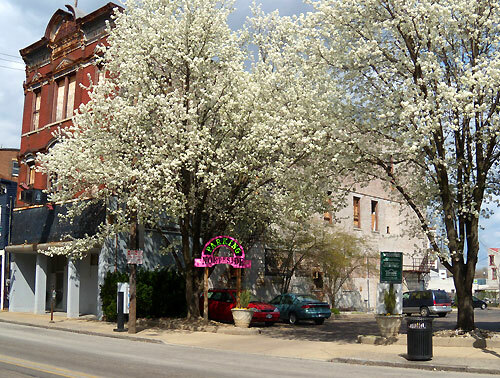 LITTLEFIELD, 3934 Spring Grove Avenue, 513-386-7570. A very upscale place! Bourbon + food + beer + art. MAYDAY, 4231 Spring Grove Avenue. Gastropub and performance space. This site is presented for informational purposes only. Neither the Cincinnati Argentine Tango Society nor ldbrown web services makes any warranties, guarantees, or representations for events or services listed on this site, or found by using any of the links on this site. Furthermore, we specifically deny any responsibility for the accuracy, completeness, correctness, or appropriateness of any of the information on this site for your dining pleasure or for any particular purpose whatsoever. We are not responsible for any loss you suffer as a result of attending events listed on this site, or as a result of using any product or service that you find by following the links on this site.